With the proper furnace selection, your central air-conditioning bills can be lower too. With these high-efficiency products available, many homeowners are replacing their outdated furnaces. Replacement costs can run anywhere from $1700 to $3500, depending upon the complexity of installation. High-efficiency models represent only about $500 to $1000 more in material costs than mid-efficiency units-- and some utilities offer rebates that cover much of the difference. The payback period depends on the price of the system, local energy costs, climate and the difference in efficiency between the old and new furnaces. IF YOU BUY HIGH EFFICIENCY FURNACE WITH 95% OR MORE AFUE YOU CAN QUALIFY FOR FEDERAL TAX CREDIT. Compared with a 17-year-old furnace, a new furnace can save the typical family hundreds of dollars per year. Based on the efficiency of your old furnace, probably 60% at best, a new furnace can cut your utility bills by 40%. Not only will you have lower utility bills, but the comfort and quiet operation. You can choose from two basic designs of furnaces: condensing and non-condensing. 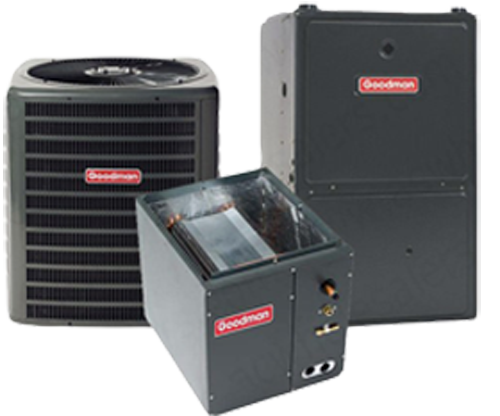 The condensing models are the most efficient and the best choice for most homeowners. The efficiencies of condensing models range from about 90% to over 95%. These models are very efficient, and only little heat is lost. Some models also offer sealed combustion for better efficiency. For the ultimate in comfort and efficiency, but at a higher initial cost, is a two-stage heat output furnace with a variable-speed blower. This type of blower is needed if you want the best central air-conditioning. These furnaces have an additional heat exchanger that takes the hot exhaust gases and extracts any available heat before it is sent outdoors. A high efficiency condensing furnace takes this extracted heat and condenses it into water and drains it. The remaining cool gases are exhausted to the outdoors. By doing this, there is no hot air escaping from your home. In addition, the venting can be done with a PVC pipe rather than up a heat resistant flue in the roof. It also reduces the amount of pollutants released into the air. All furnaces are rated for efficiency and the measurement is called the Annual Fuel Utilization Efficiency (AFUE) rating. This measurement is based on how much energy is converted to heat and how much is exhausted with the gasses that go outdoors. An AFUE of 80 means that 80% of the fuel is used to warm your home and 20% is exhausted. High efficiency furnaces register an AFUE of 90% or better. Mid efficiency have a rating of 78% to 89%. Gas furnaces are the most efficient and some can achieve a rating of 95% whereas oil furnaces with ratings over 80% are considered good. Older furnaces have about a 60% efficiency rating. If you use electricity to heat your home, consider installing an energy efficient heat pump system. Heat pumps are the most efficient for of electric heating in moderate climates, providing three times more heating than the equivalent amount of energy they consume in electricity. There are three types of heat pumps: air-to-air, water source and ground source. They collect heat from the air, water or ground outside your home and concentrate it for use inside. Heat pumps do double duty as a central air conditioner. They can also cool your home by collecting the heat inside your house and effectively pumping it outside. A heat pump can trim the amount of electricity you use for heating as much as 30% to 40%. Don't block vents or heating units with furniture or drapes. That makes your furnace work harder and uses more energy. Use only programmable thermostat. You can save as much as 10% a year on your heating and cooling bills by simply turning your thermostat back 10% to 15% for 8 hours with an automatic setback or programmable thermostat. Using a programmable thermostat you can adjust the times you turn on the heating or air-conditioning according to a pre-set schedule. As a result, you don't operate the equipment as much when you are asleep or when the house or part of the house is not occupied. Programmable thermostats can store and repeat multiple daily setting (six or more temperature setting a day) that you can manually override without affecting the rest of the daily or weekly program. When purchasing a new thermostat, look for the ENERGY STAR label (www.energystar.gov).